Meteorologists have a name for a storm that occurs when air pressure drops very rapidly as a jet stream brings in moisture: a weather bomb. In late January 1978, a low-pressure system moving from the Gulf Coast met with two other low-pressure systems, one from the Southwest and one from Canada, to create one of the worst snowstorms the Midwest has ever seen. With barometric pressure so low, it was more like a hurricane than a snowstorm, the so-called Cleveland Superbomb dumped 1-3 ft. (30-90 cm) of snow on several Midwestern states, including Ohio, Indiana and Michigan. Wind gusts approached 100 m.p.h. (160 km/h), causing snowdrifts to reach heights of 25 ft. (8 m) in some areas. Such snowdrifts made roadways impassable, forcing doctors and emergency personnel to ski and snowmobile their way to those in need. Indiana's governor sent tanks down I-65 to remove stranded trucks, while in Ohio, National Guard helicopters flew some 2,700 missions to help stranded drivers. About 70 deaths are attributed to the storm. 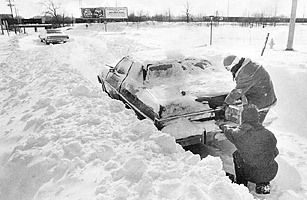 While the Cleveland Superbomb has an intriguing name, the most well-known snowstorm of that year was known simply as the Great New England Blizzard of 1978. On Feb. 6, about two weeks after the Superbomb, a blizzard dealt Boston and other parts of the Northeast as many as 27 in. (69 cm) of snow with winds of 80-110 m.p.h. (130-180 km/h). Thousands of homes were damaged or destroyed and approximately 100 people died. See photos of wacky winter weather.